I have yet to find anything better than the old-fashioned checklist for keeping track of daily tasks. This is a very powerful tool that keeps my life sane, no matter how many deadlines and things-to-do that crop up both professionally and personally. It helps prepare you for the next day. You know what’s coming. You even know if you need to adjust your usual routine. 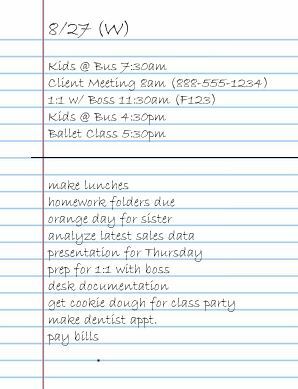 A daily checklist of tasks to complete is something I employ both at work and at home (these days that’s both). Use a spiral notebook (or something similar). Use your last 15 minutes of work and/or the last 15 minutes of your day to write tomorrow’s list. At the top of the page, list all your meetings or scheduled events. At the beginning of your day, double check your list. Add to it anything that came through since the day before (emails that popped up overnight, etc). DO break larger tasks into their individual steps. If your task is “write a book” every single day, then you won’t check that task off for weeks, months, or even years, which is demoralizing. Make your task “write 3 pages” or “write 1000 words” or “write scene A” etc. Do NOT include items that are further out in time. If you include tasks that are for later in the week/month/year, you lose the satisfaction of getting to check it off for all that time. Plus, adding tasks you absolutely won’t/can’t get to that day means your checklist will be WAY too long. You want a checklist that is manageable (another psychological trick). Move those long-term tasks to the long-term list (see below). The notebook doesn’t just have to be for checklists. If you need to take written notes (I use OneNote, but that’s not always convenient) write them on the back of the checklist or the next page in the notebook. I gave a small caveat earlier. I do use digital task lists. As a PC girl, I’m particularly partial to the task manager in Microsoft Outlook. Don’t use the digital list for the daily stuff. Use it for longer-term tasks. Things out in time that I don’t want to forget are coming or that I want to get to, but much later than today or tomorrow. Okay everyone. Now that you have the tool, go out and start checking off those tasks. I’d love to hear how it goes for you! Was this helpful? As 2016 is coming to a close, and 2017 is mere hours away, you know what time has arrived…that’s right, time to set your goals for the year. You thought I was going to say New Year’s Resolutions didn’t you? Nope! Resolution: I’m going to become healthier this year. Goals: Lose 15 pounds by April. Go to the gym every Monday, Wednesday and Friday. Limit myself to 1 coke/week. Setting goals as an author is important. Let me repeat…this is an important exercise every author should take the time to do and most don’t. Top achievers in ALL fields all set goals. Goals help you focus, move you forward, motivate you to achieve, help you to organize your time and resources, hold you accountable, help you believe in yourself, and get you closer to your dreams. Today, we will not be setting “life” goals, but “author” goals. If it helps, think of your goals in this scenario as a mini-business plan for your author life for the year. 1. What Is The Dream? Every author has a dream or two related to writing. Do you want to publish your first book? Do you want to finish a book? Do you want to get a “YES” from a certain publisher or maybe an agent? Do you want to be a best-selling author for a top five publisher whose books are made into an award-winning series of movies or HBO show? No matter how unattainable you think them, write down your dreams for yourself as an author. These won’t be your goals, but you may set some (or many) of your goals this year with the dream(s) in mind. For example: If the dream is to finish your first book, you might set a daily word count goal, or set a goal to find a mentor to help you, or set a goal to join a critique group. Evaluating where you currently are is always a great place to start. Look at what you achieved during the past year related to your author career and all the factors affecting those achievements. Evaluating where you are can help you determine where to go next. It also gives you a good baseline of what is achievable, where you could grow, and where you can let go. For example, if in the past year you finished 4 books, perhaps your goal in the current year is to finish another 4, because you know you can do it. Or, after having had that experience, you realize that pace takes away from your personal life too much, and your goal is reduced to 2 or 3 books for the year. Or, on the flip side, you might realize you can do more, and set the goal at 5. Most likely, you are starting the year with a known list of expectations. 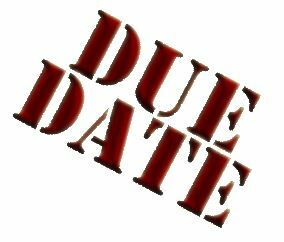 Do you have a contract with dates you owe agents or publishers your work? Do you have a pre-order date set, or you’ve announced a publication date to your readers? Have you already registered for classes? Or plan to attend an upcoming conference? Feed into the goals you set for the year. Think about past goals and expectations. The ones you were excited about achieving and working on are most likely those you did achieve or even exceeded expectations. Most authors are authors because they have a passion for the gig. So the goals you set for yourself, most likely should be ones you are excited to achieve. Passion is a key to achievement. Ask yourself…why do I care about this goal? Often it helps to categorize your goals. Categorizing means thinking of types of goals. Doing this exercise will help you cover the bases. Many authors think of their writing goals (word count, finish a book by x-date, etc.) but forget things like personal growth goals like improving as a writer, or business-related goals like spend less on marketing. This depends on you and the types of goals you are setting. Many articles out there recommend keeping your goal list short: Only 5-7 goals total. If you’re someone who gets easily overwhelmed, or perhaps you’re just starting out, 5-7 goals is fantastic. If you’re a lister like me who is 5-10 (or more) years into their career as an author, you might need more. My suggestion is write them ALL down. Then, if you look at the list and start to have a panic attack, start whittling it down to a size which makes you a little uncomfortable (you want to stretch yourself after all), but doesn’t make you want to throw up. Remember, you want to be excited to start your goals list! The SMART system is a great way to make sure your goals are not vague or irrelevant. Write it down folks. Otherwise you’ll forget about it. I promise that, when I go to review my goals and see how I’m tracking, I have already forgotten half of them (usually the half I’m not working on yet). Check your goal list often. Once a quarter (every 3 months) is a good rule of thumb. If you have goals happening every month, then once a month is better for you. Check off those goals which have been achieved. Look at remaining goals and your progress. Has anything changed which affects your list? Reevaluating your goals isn’t just about checking things off the list. During the course of a year things are going to happen which could impact your list in big ways. Sometimes life gets in the way, and you need to pare back your goals. Which is okay! Sometimes an achieved goal can lead to more unplanned for goals. For example, you could have a goal of landing a contract with a publisher. Let’s say that happens. Yay! But they not only signed your book, but contracted 3 more for the series with specific due dates, many within this year. I promise, you’re going to need to add those to your goals and likely re-prioritize your list. I hope this article helps you create a fantastic goal list for the year. And I hope you achieve not only your goals for the year, but also your dreams!